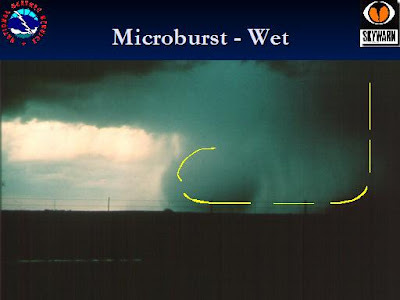 Mike Wilhelm's Alabama Weather Blog Bamawx.com: What is a Microburst? A microburst is a "localized column of sinking air, producing damaging divergent and straight-line winds at the surface", according to Wikipedia. There are two types: wet and dry microbursts. The term was coined by the famous tornado and severe weather researcher Theodore Fujita to describe the rapid downward burst of air that accompanies thunderstorms and fans out in an area of up to 2.5 miles in diameter. The NWS in Norman, OK defines a microburst as, "A small, concentrated downburst affecting an area less than 4 kilometers (about 2.5 miles) across. Most microbursts are rather short-lived (5 minutes or so), but on rare occasions they have been known to last up to 6 times that long." A thunderstorm which produces a wet microburst is not necessarily "severe", meaning that it doesn't necessarily have to produce 3/4 inch hail or contain winds of 58 miles per hour or greater. Winds in a microburst can be anywhere from 45 to 150 miles per hour. "Ted Fujita, the late Japanese researcher, was the first to propose the existence of the microburst, which he called a "downburst." The theory arose as he flew over a remote Siberian forest in a helicopter in 1972. Below were thousands of large trees blown down for hundreds of square miles. His Russian hosts told him it was probably a giant tornado. But Fujita knew better. The trees were blown outward from a single point. A tornado moves along a path. Fujita, already famous in meteorology as the man who developed the "F scale" for tornado strength, was brought into the world of airline crashes in 1975 when an Eastern Air Lines official, Homer Mauden, asked him to review data from the mysterious crash of an Eastern Boeing 727 at John F. Kennedy Airport in New York on June 24, 1975, which killed 112 people. Fujita's verdict was clear: It was a downburst." Huntsville, Alabama has been hit by deadly microbursts before. Perhaps the worst was on July 7, 1984. There is an excellent article by WHNT 19 reporter Steve Johnson on that subject here. "July 7th, 1984, was a lot like any other mid summer day. It was partly cloudy, hot, humid, and a good day to be on the river. 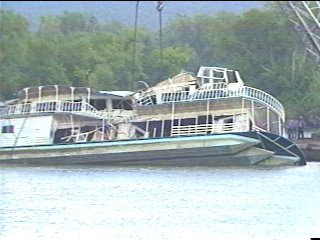 But on that day 22 years ago, a thunderstorm popped up in the late morning hours, and 11 people died on the Tennessee River because of it. In large part, the deaths were caused by a microburst from the storm - a strong wind, that lasted a few deadly seconds." Finally, here is an excellent video in which Warning Coordination Meteorologist, Dan Gudgel, National Weather Service, Hanford, CA describes a microburst and it's cause and effect. Video of a microburst in progress and it's assocaited damiage is included in this clip. Weather tragedy in Huntsville, Alabama. Nature put on a show!